The only danger of bringing this orchid into your home is the addiction that will almost surely consume you. Once you are bitten by the orchid bug, you'll be hooked. 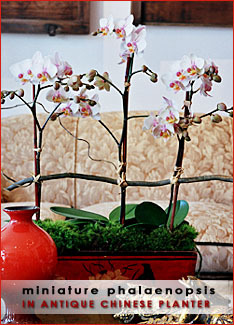 The pure white petals and luscious red lips of this Phalaenopsis are a textbook example of the beauty of contrast. Placed in a classic ceramic vase, it makes a perfect conversation piece. For decorative container, choose below. Click image for more options.